The product is a mixture of selected short chain maltodextrins (derived from corn starch) and a protein concentrate supplemented with amino acids. The protein source has been designed to match the constituents of whole egg protein. Animals or birds which are off their food or with wasting problems can be helped during treatment by feeding Critical Care. This needs to be sufficiently often to be effective yet not too often that it compounds the problem due to stress. The product should be made up freshly each time. It has great benefits over commonly used liquid formulations of easily digestible carbohydrates in that it is a powder and can be stored until a small amount is needed. 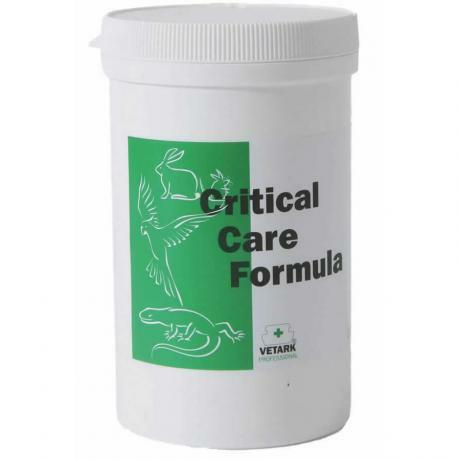 Critical Care in powder form remains stable for months provided that the container is sealed and also provides a suitable protein source which counters the hypoproteinaemic states of catabolism, which in birds especially is a major problem.